DON'T EVER MISS A NEW LISTING AGAIN! Look at those smug neighbors, lounging around on their stylish teak patio furniture, sipping cocktails, and loving life. Meanwhile, you’re behind on mowing the lawn and trimming the hedges. Who has time to prep for a patio party when you can’t even keep up with the regular stuff? Shouldn’t you get to kick back on your lawn, too? Grass doesn’t grow on rocks. Besides stating the obvious, what that really means is that they’re the perfect, versatile tool for creating a low-maintenance outdoor space. Use them to create walkways, or group them together to form decorative outcroppings. You can even lay out stones to be ornamental dry creek beds. Small yards, especially in desert climates, can be completely rocked over, or you can use them as strategically placed accents. And if you’ve got spots that are constantly wet, they’re great for keeping mud (and mosquitoes!) under control because they’ll help the water run off instead of collecting. Speaking of wet areas, do you have a depressed corner of the yard where puddles rule? Try a rain garden, which is kind of a mini-wetland that reduces storm-water runoff. And done right, they’re almost maintenance free because they require no mowing, no watering, and little weeding. They make much prettier focal points than soggy grass, too. 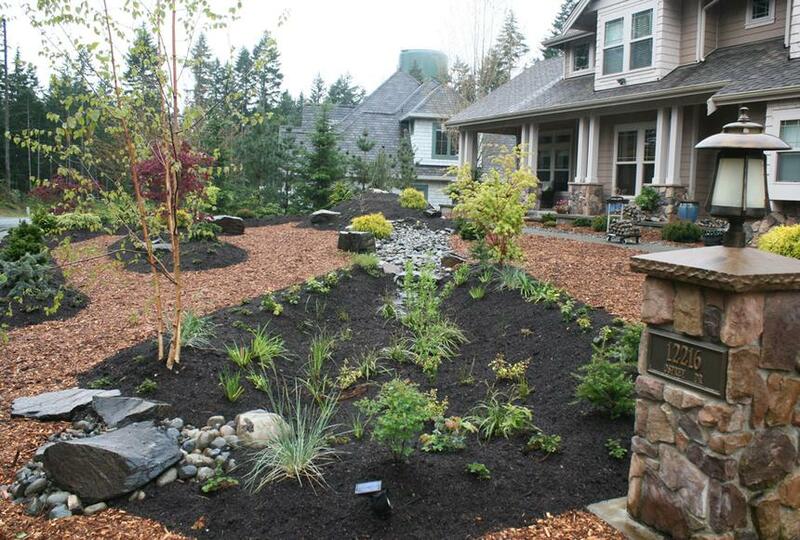 Rain gardens are fairly easy to create, using gravel, sand, and native plants. The idea is to slow down rainwater so less of it goes into the sewer system, and more is used to nourish plant life. Decks do require some maintenance, but you don’t have to mow ‘em every weekend, that’s for sure. And a platform deck — no steps, no railings — is the easiest of all. “There are lots of dense hardwoods like ipe and cedar, redwood and composites that last a long time and are very low-maintenance,” says Tomi Landis, president of Landis Garden Design in Washington, D.C. While you’re dreaming of your new deck, think about this: How you will use it? “Will you be using it in the morning while having coffee?” Landis asks. “If so, it should be oriented to the east. If it’s mainly for dining out in the evening and having cocktails, it should be facing west.” But be sure shade is available in the hotter months. Not all grass is created equal. Tall grasses, like switchgrass, bluestem, muhly, and fountaingrass, all grow fast and require very little TLC. Nor do they ever get mowed. “Native grasses are a great solution to a lot of landscaping problems,” Landis says. They soak up lots of water and provide an organic privacy screen while trimming your mowing time. Group along a fence line. Group into geometric patterns in your yard for a clean look. Go more random for a more natural look. The most maintenance you’ll do with these is cut them back in late fall. They dry up in the fall, which sends some of those glorious long leaves flying across your yard. But they can be used as (free!) mulch or ignored. They’ll do no harm. Like the rocks above, pavers (sometimes called “steppers”) are decorative stones used to create pathways that need little or no care. “A stepper in a natural shape looks really great in a lot of contexts,” Landis says. Traditional house styles like bungalows, colonials, and Victorians tend to go well with more natural pavers, like flagstone. If your house is more on the modern side, opt for some rectangular or square pavers. Some purists might consider fake grass to be over the line, but the newer faux turf doesn’t make your yard look like a putt-putt course, nor does it get so hot it burns your feet like the fake turf in your parents’ day. It doesn’t need to be cut, watered or fertilized, and pets can’t kill it. Where there are trees there shall be no grass. But there will be shade, and that’s a plus for picnicking and lawn-chair lounging. “Trees can soak up a lot of rainwater,” Landis says, and therefore, need a lot of water. Consider your local climate, as soaking up water can be good or bad. Do you need to sop up excess water? Is the yard already too dry? Keep in mind that native trees are less maintenance because they’re adapted to your area. Color is the secret to a stunning yard, but that doesn’t mean you need to plant a garden full of labor-intensive dahlias. It means choosing bright pots, benches, bird baths, Adirondack chairs — anything that just sits there and looks lovely while you pour the cocktails. The options are as numerous as the Pinterest search results for “yard art” (which is somewhere between 5,000 and infinity). And if you decide to pop some colorful flowers into your colorful pots, what could be better a better backdrop to your finally-realized cocktail party?